Entering the Lee-Chin Family Gallery at the Burlington Arts Centre in October 2011, I entered a time portal that didn’t take me to another place in time but rather brought thirty years to me. 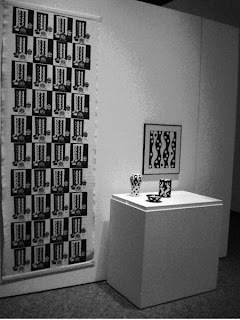 Seen was a grouping in Black and White: Black and white Polka dot screen printed yardage, 1984, checkerboard pattern cotton fabric 3 meters X 1 meter, Black and white Polka dot vase 1986, white stoneware, coloured under glaze, transparent glazer over top, 22 X 11.5, Black and white Polka dot covered jar 1986, white stoneware, coloured under glaze, transparent glazer over top. 17.5 x 12 cm, Black and white Polka dot bowl, 2008, white stoneware, coloured under glaze, transparent glazer over top. 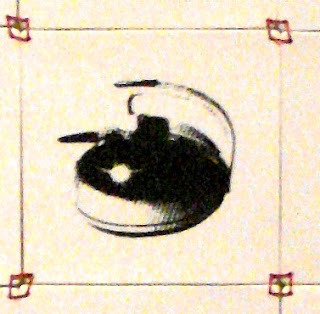 4.5 X 16cm, all on a pedestal in front of a framed Black and white Polka dot screen printed fabric 1986, cotton fabric, 40 X 35 cm. This grouping from across time is actually foretold in the earliest piece. The image which is used in a positive and negative repeat to create the checkerboard pattern on the 1984 screen printed fabric is of the collection of stoneware and piece of cloth artfully arranged to the right of the hanging yardage. Is this a clever stage set, a time trick or proof of an unchanging design sensibility and way of working? Gloria Hickey, as curator, has had the opportunity to explore a body of work created over a thirty year period (1978 to 2011); she has chosen to focus on methodologies that, while intrinsic but not exclusive to textile practices, are insistently present. When Hickey says: “Her work in ceramics consistently reflects two major influences that have shaped Canadian art –namely, formalist abstract aesthetics and feminism. These influences are seen in her characteristic use of colour and pattern on her surfaces and in the celebratory reference to the domestic textile arts or women's work.”, she reveals much more. There is a story that unfolds in front of the viewer which is complete in each individual piece; it was there when it was made. This story is created by each decision that chooses format, textile or ceramic and with in the ceramics with each form/ shape [bowl vase, plaque] -- whether thrown or slab. Patterning is ever present in her glazes and “subject matter” which is always referenced directly on the surface. Nothing is just what it seems while completely as it seems. A tea pot is a tea pot. To think that the “feminist” work is obvious and separate from the merely decorative pieces would be a mistake. There are narrative pieces like “the Brides,” 2002, which consists of three head stone shaped slabs 46 X 19 cm of white stoneware, coloured under glaze, transparent glazer over top each with an accompanying “bed” 18 x 16.5 x 29cm with embroidered sheets. There are “pieced” porcelain wall hangings with silk screen images: “Security Blanket” (1997) with silk screened images of domestic items, porcelain slabs, embroidery floss 74 x 54cm (collection of the Burlington Arts Centre and only shown there), Family (1999) consisting of portraits, True Blue (1997) also portraits, and the Ties That Binds (2000) with images of clasped hands which can be read as quilts. The "pieced" porcelain wall hangings reference changes brought to traditional quilting during the 1970s as feminists artists claimed that media. These include the African-american Faith Ringgold who art historian Elissa Auther in her 2010 book String Felt Thread* speaks of as disassociating herself from quilt making and craft in spite of her use of pieced and quilted textiles to make her work and Canadian Joyce Wieland who incorporated quilt making into her art practice in the 1950s and returned to it often during her career. While the wall hangings are simple 9-patch constructions, later stoneware pieces are glazed with more complicated quilt patterns such as the Blue Bowl (2008) with an 8-pointed star pattern with peace symbol. Jonathan Smith, MFA University of Chicago, in his catalogue essay “Grid and Planes: order and Structure in Alexandra McCurdy’s Sculptural Work” states that “ the strong reference to textiles in her subject matter also supports the compositional device that underlies much of her work and serves to unite two formal aspects of her ceramic work – the two dimensional imagery or pattern and the three dimensional form.” Image/ pattern, form/ shape, method McCurdy moves back and forth through a relatively small but closely related terrain of textile design, domestic traditions, and history. Replicating Mi’kmag quillwork with slip and silk screened portraits of iconic woman, “Blue Chicago and Friends”, (2009) artist bring forth questions of “appropriation of voice,” a question which arose as a result of the “Naming and Claiming” tactics of the mid seventies feminist art movement and which exploded around Judy Chicago’s Dinner Party. Interestingly, while each piece feels central to the time of its creation, something about them remains current and relevant in today’s numerous cultural discourses. Smith goes on to say “In the quilts the monotone colour and graininess of the images from the silk screen process depersonalize the image so that the viewer looks at it as a universal symbol instead of a particular object or thing” I don’t agree with that, while imagery on “Security Blanket” is of domestic appliances they are completely grounded in a North American context and work because they are recognizable as such and if the woman in “Blue Chicago and friends.” Where not recognizable what would be the point of the work? In the past two years Canadian art audiences have witnessed a re-examination of contemporary arts and crafts in Canada during the last third of the twentieth century. In retrospectives of the work of: Kai Chan: A Spider's Logic. A look at 35 years of one of Canada’s premier fibre artist (1. on tour through 2012), Martha Wilson: Staging the Self, a survey of a former NASCAD university student’s ground breaking multidisciplinary/ performance and video work, founding member of Franklin Furnace in New York and one of North America’s leading feminist. (2. on international tour through 2013), in group shows: "Traffic: Conceptual Art in Canada 1965 - 1980" (3. on tour through 2013) and “THIS IS PARADISE/ Place as State of Mind: The Cameron Public House and 1980s Toronto at the MOCCA, Toronto Jun 25, 2011 - Aug 21, 2011. These exhibitions present a wider context from which to look at “The Fabric of Clay” and see where Alexandra McCurdy's concerns and objectives align with her contemporaries. 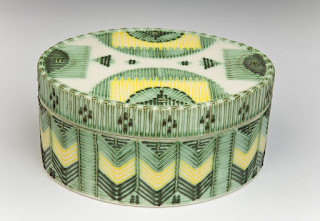 There are differences in opinion on how the decorative arts need to be categorized, how contemporary craft can be looked at as art and how contemporary artist use craft mediums such as textiles and ceramics. If, because of her craft practices, some would suggest the meanings of her objects are negated by function: meaning and function are supposedly incompatible because the craft object can be replicated over and over and over but is that not one of the assertions of the feminists art movement to claim meaning for the mundane repetitiveness of “women’s handicrafts” Recent craft theorist have imbue the multiple with equal conduit for or location to anchor meaning as the single one of a kind object regardless of function. In an ongoing series of porcelain boxes starting in the early 1990s with “Blue Butterfly Box” (1992) and continuing through out her career “Black Box with Raffia” (2009) she takes porcelain to virtuosic level of non function. Of slap construction with inclusions of slip covered grid wire with the appearance of piercing, some with electrical wire, some with raffia woven through the openings these enclosed boxes are decorated with beads and glazed in what appears to be shibori or other resist dye processes. These are nothing but beautiful with no other function then to be admired. The theoretical discourses to which art is subjected at different times call forth support or lack thereof for the pieces. Change is inevitable, and the discourses may or not may have been acknowledged by the maker. Any retrospective takes you on a journey; this one takes you on several simultaneously. It is the multiple agendas at play with in Alexandra McCurdy’s body of work which make it interesting. It is her technical skill, evident in all the work that rewards your interest.